Michael M. Rozier was born March 1, 1961 in Camden. Small, fast and sturdy, he was a sprinter and running back for Woodrow Wilson High School in the late 1970s and smashed countless school records as a member of the Mighty Tigers football squad. The field where he set many school records now bears his name. Despite Mike’s gridiron heroics, he was not heavily recruited. The best offer he received was from the University of Nebraska. An assistant watching game films of Pennsauken (whose star player was future 49er John Taylor) noticed Mike’s play during a game against the Indians, and suggested the Cornhuskers recruit him. Unfortunately, Mike’s grades and scores were not up to par. He spent his freshman year stashed away at Coffeyville JC in Kansas, where he got a handle on college academics and led the Ravens football team to a perfect 9–0 season. As a sophomore with the Cornhuskers, Mike played his way off the bench and into the starting lineup, eventually supplanting another future 49er, Roger Craig. As a junior in 1982, Mike set a school record with 1,689 yards. He was fast and powerful and seemingly impervious to injury. In a game against Missouri, Mike was not going to play because of a hip pointer. Coach Tom Osborne inserted him in the game after Nebraska fell behind and he ran for 139 yards in the second half to spark a comeback victory. Only a narrow loss to Penn State prevented the ’Huskers from having a shot at the national championship. Mike completely destroyed the record books as a senior. He ran for 2,148 yards and 29 touchdowns, and averaged nearly 8 yards per carry. At times he was literally unstoppable. In the first half of a game against Kansas, Mike ran for 230 yards. He topped the 200-yard mark in each of his last four regular-season games. He was an easy pick for the Heisman Trophy that year. Nebraska averaged 52 points a game, and earned a berth in the Orange Bowl, where they played Miami for the national championship. In that game, Mike ran roughshod over the Hurricanes in the first half, but an ankle injury knocked him out of action. Miami won the game 31–30. 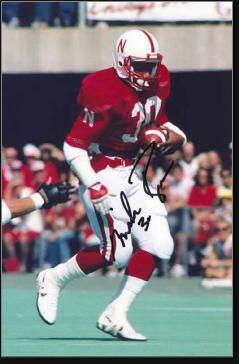 Mike was drafted by the Houston Oilers in the NFL and the Pittsburgh Maulers in the USFL. He chose to signed with the new league and amassed 1,051 running and receiving yards in his first pro season. In 1985, Mike played with the USFL Jacksonville Bulls. Because the league played games in the spring and early summer, Mike was able to join the Oilers after the USFL folded in the summer of 1985. He gained 462 yards for Houston to set a record for the most yards gained in the same year in two different leagues—1,823. Mike stayed with the Oilers for six seasons. The injury he suffered in the Orange Bowl never fully healed, which kept him from competing at his very best, but he was still a dangerous runner. His best year was 1988, when he surpassed 1,000 yards for the first and only time in the NFL. He was a Pro Bowl pick in 1987 and 1988. Mike finished his career with the Atlanta Falcons in 1991 and moved back to South Jersey with his wife, Rochelle, after his playing days. In 1996, Mike and his childhood buddy Bart Merrill were hanging out with a third friend, Louis Pierce, in Camden when Pierce suddenly pulled out a gun and started shooting. Mike and Bart were both wounded, but made full recoveries. Pierce received a life sentence. Merrell was murdered two years later in another section of Camden.